An author's awesome adventures about actions afoot! I had a groovy day. Seriously. It blew my mind. 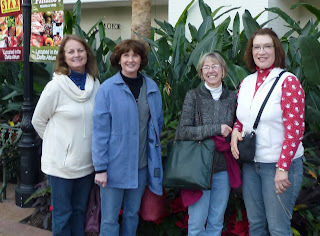 The good times rolled when I met up with three other chicks from the class of ’69: Bette, Kay, and Janie. Beats me why we hadn’t done this before. We were in the zone with the good vibes flying. Greeting, hugging and five minutes later . . . on the road again, baby. Snooze you lose. Downtown Nashville. Standing in line at Walgreen’s where the chicks in front of me bought beer to stuff in their purses—for possible consumption at Spam-a-lot? My turn, and the cashier called me Ladybug. Far out. From there to Puckett’s Grocery and Restaurant. Hmmmm, grocery and restaurant. Flashback: eating at a table in Traucht’s IGA with a candle and white tablecloth. Not! A couple of the chicks had their first tastes of Southern barbeque and Southern hospitality. Constantly repeating, “Do you remember when . . . .” Some memories are shared; others belong only to the individual. Back then, we were all into ourselves. In rehashing events in the past, the years—and both real and imagined slights—melted away. Life is too short to do anything but laugh. Onto the next destination. Man, we were trucking it! A trip to Opryland Hotel had us tip-toeing through the tulips. We scoped out a free parking lot—avoiding the $18 charge—and went ape over the indoor river, waterfalls, the jumping fountain, and the sheer beauty of the gardens. Contemplating life over cookies and milk instead of booze and chips. Believe you me, the whole scene was bitchin. The fickle finger of fate—and a flood—had closed the nearby mall, but we hadn’t wanted to shop anyway. We took five, then onto a fancy-schmancy restaurant. The GPS, otherwise known as Tom Tom, led us on an unusual route; we began to think he was over 30 and not to be trusted. But, in due course, we arrived at Mere Bulles (meaning Mother Bubbles because the lady of the house really dug her champagne). Bring on the wine but no Mad Dog for us. We sold out and became part of the Establishment some time back so we had enough bread to pay for the eats. Two and a half hours later, the waitress socked it to us. Back at the ranch, a late-night phone call to one of the guys in our class left us in giggles. We didn’t zonk out until 1:30 ‘cause we were flying high on life. Are we having fun yet? You bet your sweet bippie! We strolled over to Vanderbilt to check out the college scene. I wasn’t freaked out or anything but suddenly had a flashback . . . I envisioned myself forgetting to lock my car. 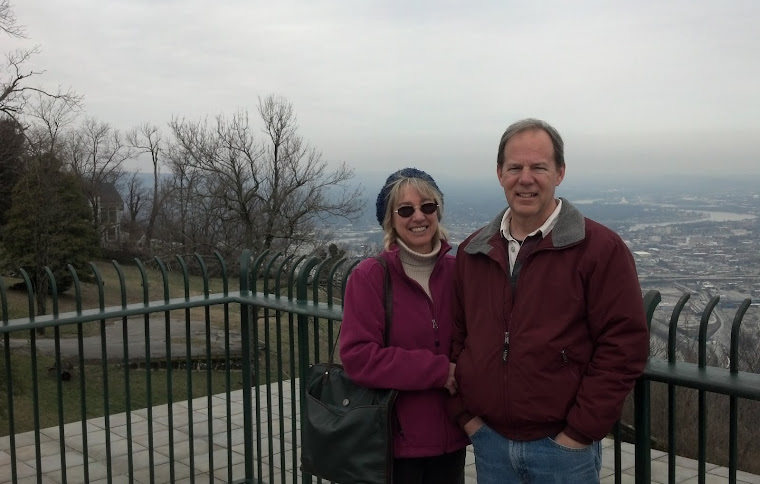 We returned to the scene of the crime—and, yes, I had forgotten—where we planned our escape route to the Belle Meade Plantation. Horses, slaves, and parties where the host handed out diamond party favors. Life was good for the good ole plantation owners . . . until it wasn’t. Dinner-time and here come da judge . . . Judge Bean’s, that is. Business was slow, and we netted ourselves a sweet little chickadee . . . young, blonde, China doll perfect with a downer of a tattoo engraved on her forearm. When we asked its meaning, our waitress launched into her life history. You know, a story that could belong to any one of us but for the grace of God (and/or good common sense)—in with the wrong crowd, drugs, drug-pusher boyfriend who got himself arrested. Once he was out of the picture, she got squeaky clean only to tell us her sweet boyfriend was released and ready and willing to resume their relationship. With the advantage of hindsight and one qualified counselor among us, we offered up advice: lose the loser, there are better fish in the sea . . . and offered our own young men as proof. (Each of us has a single son.) To show our good faith, we each left a fifty percent tip. Radical. Back to the ranch and we rocked on. Man, what a rush. Remember the haunted house? The sock hops? The good-looking lifeguard? The walk-out? The rat who juggled several senior girls simultaneously? The finger we painted on a piece of cloth and ran up the flagpole? The fights, the tears, the sorrows, the angst? Could be Any Teen, Anyplace, USA. Midnight came too soon, and morning came even sooner. Hugs, kisses, love-yous, and promises to meet again. In the car where I went all zen. Another flashback in which I envisioned myself walking out of the hotel room without a suitcase. Back for more goodbyes and my bag. The weekend was an absolute blast. We let it all hang out. Smiling on the return trip, wishing my girlfriends and I could have had another day. Smiling extra hard when I passed an RV towing a car towing a moped with a full-sized, fully-clothed, helmeted stuffed gorilla at the wheel. Outta sight! Keep the faith, and have a nice day. I’m a gal, raised on a farm. That’s not it. I never did. Ignoring tasks that should be done. After all, I wanted fun. You want a list? Here are a few. I wanted ‘feesh’ for supper, true. I ‘axed’ a friend to see his toad. My accent sounded very quaint. That made me what I am today. A special charm that made me shine. “Is it because of things you miss? The coal that drifted through the air? Puking on the bus to school? I lack the charm of yesterday. And there it is. And there’s the twist. Hello, out there! I'm back! I got blindsided by a two-week Christmas vacation. Of course, preparation took a week and recuperation took two more. But, then again, I’m well aware that “real” writers wouldn’t let mere vacations trample their enthusiasm for getting their stories down on paper. But the truth is that I’ve been discouraged, and it’s hard to write creatively with the sword of rejection aimed at my heart. And the sword is double-edged. One side pierces my dreams of publication while the other slashes my desire to write. But maybe I should stick with what I’m good at AND what I love. I eased myself back into writing this past week by spending hours criticizing others’ work. (If I could only get paid for criticism!) Despite the fact that I’m fearless with my red pen (virtual, that is), the members of my critique group seem to appreciate my input. And that’s what it boils down to. Being appreciated. While writing my picture books, I elicit laughter from myself. Yes, it’s true . . . I laugh and laugh and appreciate me. Yet, when I send off what I consider polished manuscripts, they get nowhere. I can only assume the agents and publishers greet my works with stone-faced disappointment, and that just makes me sad. Appreciation, recognition, love. It’s what we all crave. And the only way it’ll come my way in the publishing world is to put my self-appreciative, silly self out there. ACTED in Pick-a-Dilly. A Dilly sister, I batted my eyes and lisped, “I thimply ADORE big, throng men like you!” The highlight? My blood-curdling scream! BORN without a blueprint for wisdom teeth. CERTIFIED to teach at age 54. DREAMS of publication. EMOTIONAL, crying over movies, books, news, and the National Anthem. FARM-RAISED, just what you hope for in a chicken but not a salmon. I don’t know about a woman. GROWING as a writer. HAPPY to be alive! ITCHES with mosquito bites but not poison ivy, opposite to my husband. Kids remain itch-free. JITTERY when speaking to a crowd. KILLS too much time. LOVES the hubby and two grown kids. LOTS! MUSICALLY-disenfranchised at singing and playing a horn. NEVER lets soda pass my lips. OPTIMISTIC. PERSISTENT. QUARRELSOME when hungry. RICH with friendships. SMILES crookedly. TIRED of living far from the kids. UNIQUE in that I grew up with an outhouse! VOLUNTEERS as bingo caller. WEARS only comfortable shoes. X chromosome makes me who I am. YELLS only when yelled at. Ahem. ZUMBAS like crazy! Copyright by Bonita Herold, March 2011. Simple theme. Theme images by luoman. Powered by Blogger.